The data is an average for 2017 and 2018. 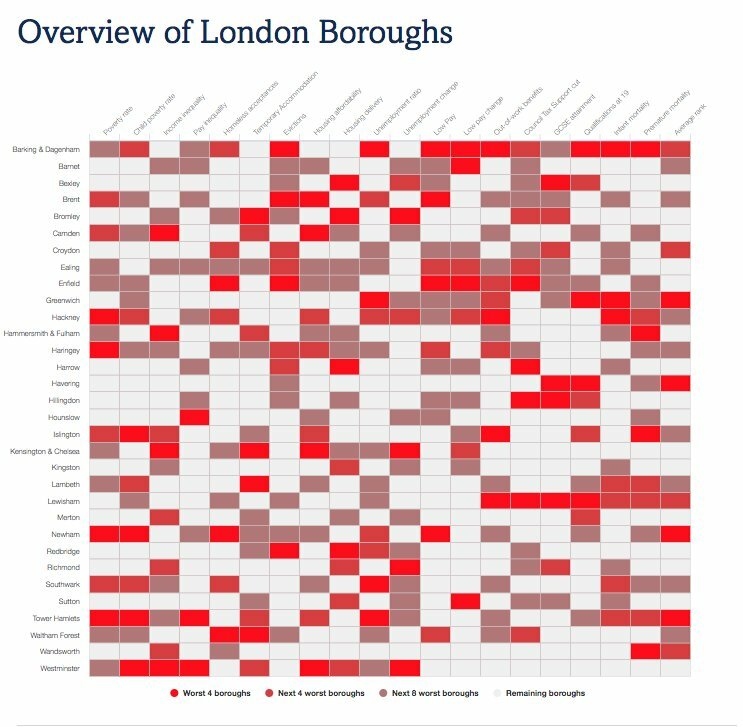 This graph shows the proportion of jobs in workplaces in each borough that are low paid, regardless of where the employees doing those jobs live. The overall proportion of jobs in workplaces paid below the London Living Wage in London is 19.3%, or 790,000 low-paid jobs. Jobs based in London are less likely to be low paid than the jobs worked by employees living in London. The figure for Inner London is 13% (360,000 low-paid jobs) and for Outer London it is 30% (420,000). The lower proportion for Inner London reflects the large business districts such as the City and Canary Wharf, with highly paid jobs often taken by commuters. Tower Hamlets and Islington have the lowest proportion of low-paid jobs at 11% each (26,000 and 21,000 low-paid jobs respectively). This is followed by Westminster (12%) and Camden (13%). These are all Inner London boroughs. 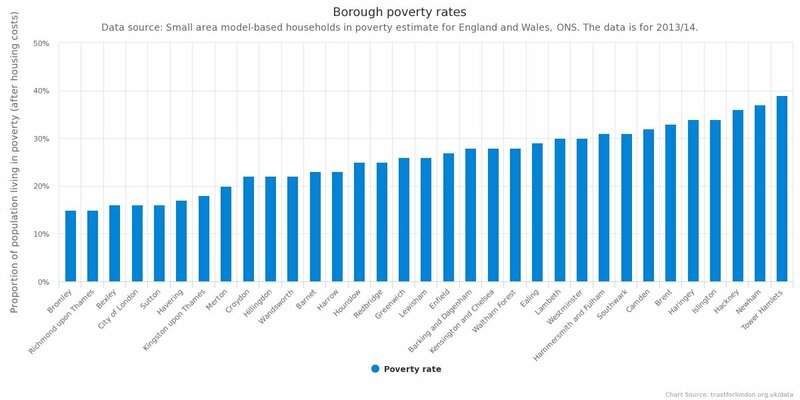 These boroughs have low proportions of low paying jobs but because they contain a large number of the jobs in London (1.3 million, 32%), together they make up a fifth (20%) of all low paying jobs in London. Westminster alone accounts for 14% of the jobs in London, and 9% of all low-paid jobs. It is the borough with the largest number of jobs, at 570,000, with 69,000 of them being low paid. Redbridge had the highest proportion of low-paid jobs at 45%, however, because it has a relatively small total number of jobs it only has 17,000 low-paid jobs. It is followed by Sutton (40%), Waltham Forest (38%), Enfield (37%) and Brent (36%). These are all Outer London boroughs. Some boroughs contain many more low-paid jobs than low-paid residents or vice versa. In Tower Hamlets only 11% of jobs are low paid whereas 19% of residents are low paid. Many of the higher paying jobs are not taken by residents of the borough. At the other end of the spectrum is Sutton where 40% of jobs are low paid but only 21% of residents are low paid.